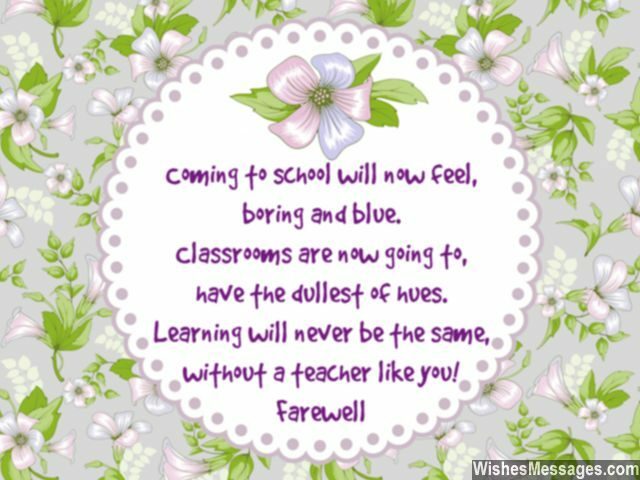 Farewell Messages for Teachers and Professors: Take ideas from these inspirational quotes to write a personal message on a greeting card. Use heartfelt words in a farewell speech to say goodbye in a way that it shows gratitude. Whether it is the call of a new job or retirement – get the class together and shower your teacher with smiles, hugs, best wishes and luck. Sweet Facebook posts, cute pins on Pinterest and funny tweets will be a cool touch in the farewell festivities for teachers and professors who are active on social media. Teaching is a thankless job which involves tolerating naughty and disrespectful behavior all the time. This is your chance to show that despite everything, you have nothing but respect and admiration for someone who stood by you through it all. 1) Classrooms are now going to have the dullest of hues. The school is now going to feel, boring and blue. Most importantly, learning will never be the same without a teacher like you. Goodbye. 2) You taught, not just what ought to be taught… but also what you thought we needed to learn. Thanks for everything, farewell. 3) Astronauts, physicists, programmers, musicians, technologists, doctors, engineers, lawyers and all the other professions that make the world go around have one thing in common – a good teacher who gave light to their dreams. Farewell, to one such teacher. 4) You will easily find a new set of cool students like us… but we’ll never find another cool teacher like you. Goodbye. 5) No one can really say good bye to a teacher, for they forever stay in little homes called… hearts of their students. Farewell. 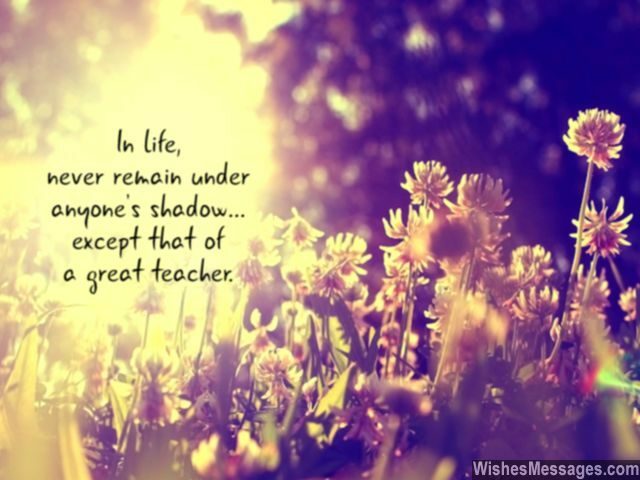 6) Never remain under anyone’s shadow in life – except for a great teacher’s. This is a piece of wisdom we’re all happy to follow. Farewell. 7) Today I am creating a few new boards on my Pinterest in your honor. They will be called Inspiration, Motivation, Knowledge and Wisdom – because that is what you have given us all these years. Farewell, to my favorite teacher. 8) Dear teacher… you may be away from me, but your teachings will never be. Goodbye. 9) The backbone of a good school is not made from fancy classrooms and large campuses. It is made from the excellent education imparted by teachers like you. Farewell. 10) There’s no such thing as goodbyes and farewells when it comes to teachers… because their teachings forever stay in their student’s minds and hearts. 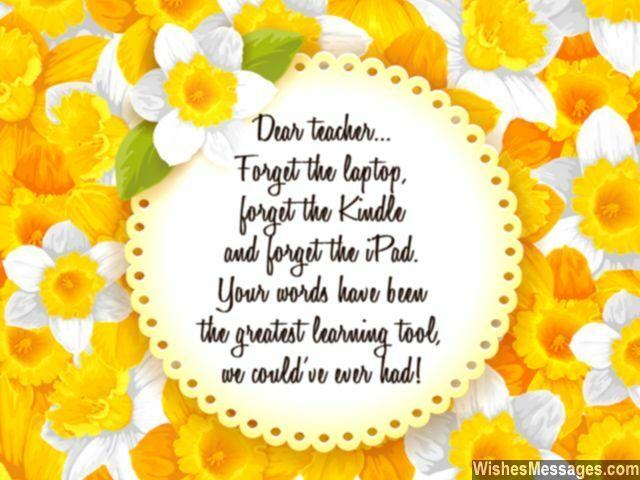 11) Forget the laptop, forget the Kindle and forget the iPad… your words have been the greatest learning tool we could’ve ever had. Farewell, to our favorite teacher. 12) Good teachers teach not just by reading out textbooks, but by lighting up imaginations. Farewell to one such teacher. 13) Cheers and tears, high fives and cries – this is the crazy roller coaster ride of emotions that we’re going through, will bidding farewell to an awesome teacher like you. Goodbye. 14) Nobody cares whether it is Monday or Friday, because when you teach it’s always a FunDay. Goodbye. 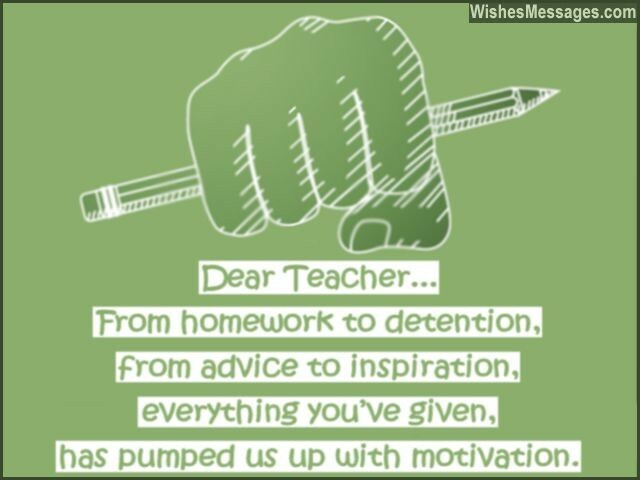 15) Dear teacher… wishing you farewell is the worst thing I have done as a student so far. Such an irony, that it is even worse than all the long hours you made me spend in detention. We’ll miss you, goodbye. 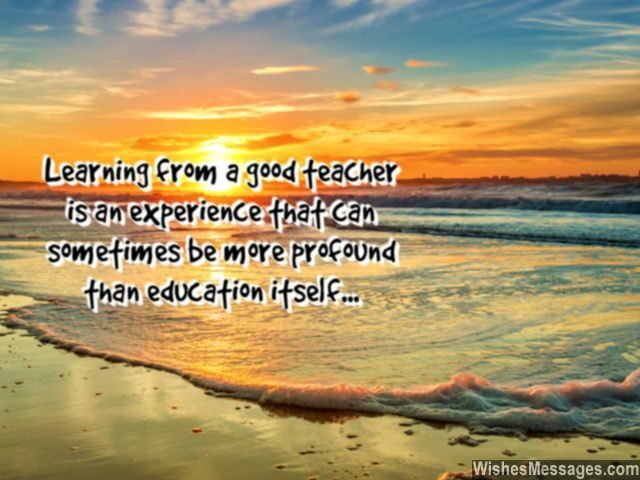 16) Learning from a good teacher is an experience that can sometimes be more profound than education itself. You have given me just that. Thanks, farewell. 17) For you, teaching might have been a job. But for us, learning from a teacher like you was nothing less than a once in a lifetime experience. Farewell. 18) Just like how flowers spread fragrance wherever they are kept, teachers spread knowledge and wisdom wherever they go. Farewell and good luck. 19) Our school has incurred the biggest loss in its history – the resignation of a great teacher like you. Farewell. 20) Dear teacher… we are bidding you farewell but we our hearts will never say goodbye to the wonderful things you’ve taught us. 21) Awesome teachers like you, rare to come by. It is impossible for us, to say goodbye. As we bid you farewell, we can’t help but cry. 22) Saying goodbye to a teacher as awesome as you engulfs, us in a tornado of emotions. We might be giving you a standing ovation, but from inside we are weeping tears that could fill an ocean. 23) The word farewell contains the essence of the kind of teacher you were to us – a FAIR teacher who inspired us to do WELL in our lives. Thanks a lot and farewell. 24) Goodbye to a teacher, who has been less of a tutor, and more of a second mother. 25) I am angry and jealous, because students of another school are about to get a fabulous teacher while we are about to lose one. Farewell. 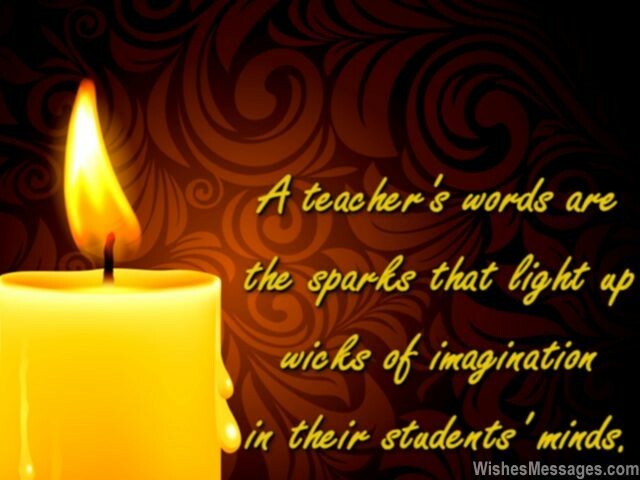 26) A teacher’s words are the sparks that light up wicks of imagination in their students’ minds. 27) You may be leaving the school but the knowledge you have imparted has been engraved in our minds forever. Goodbye, all your students are going to miss you. 28) The school should give awesome teachers like you a permanent detention so that you would never be able to go away. Farewell. 29) While the school is mourning the loss of an exceptional teacher, the students are mourning the departure of a person no less than their mother. Farewell. 30) I refuse to learn Science from any other teacher who cannot make Nature come alive in front of my eyes… just like how you did. Farewell. 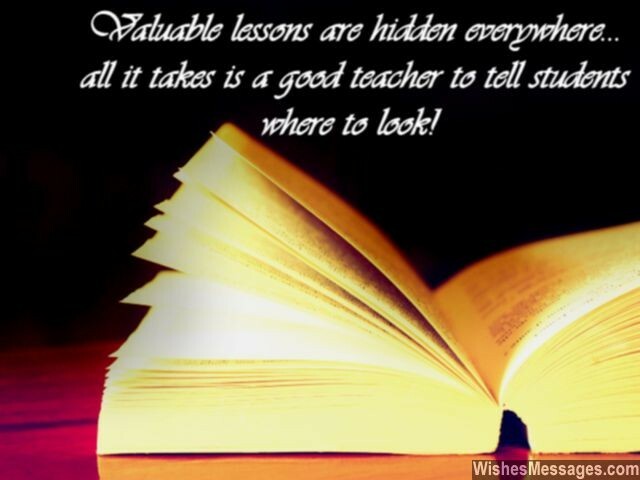 31) Valuable lessons are hidden everywhere – but it takes a good teacher to tell students where to look. 32) I officially hate the head hunter who poached a brilliant teacher like you from our school. Farewell. 33) The joy of getting good grades isn’t going to be the same anymore, because I won’t have a teacher like you to pat my back and help my success soar. Farewell. 34) Dear teacher… you didn’t just teach me how to count, but also to how to make myself count. Farewell. 35) May you dislike your new job, get disappointed with your new students and find your new colleagues boring… so that you can come back to our school and be our teacher once again. Farewell. 36) From homework to detention, from advice to inspiration… everything you’ve given, has pumped us with motivation. Thanks. 37) Dear teacher… we may forget most of the things you taught us from the textbooks, but we’ll forever remember everything that you said from the heart. Farewell. 38) If all teachers were as cool as you, students would never feel blue. Farewell. 39) I may forget what was taught to me in school. I may forget the pranks I played in class and I may forget all the tests in which I failed. But I will never forget the reassuring words of my favorite teacher. Goodbye. 40) Your contribution in our lives has been exactly like the kind of teacher you are – special and priceless. Goodbye.